Anyway, the other day I decided to make a go of swapping the buggers out- I'm tired of hearing the electric cooling fans rumbling to life first thing in the morning immediately after I start the car. With this, combined with a soft code of P3081(Engine temp too low(????! )), I decided to do the work. 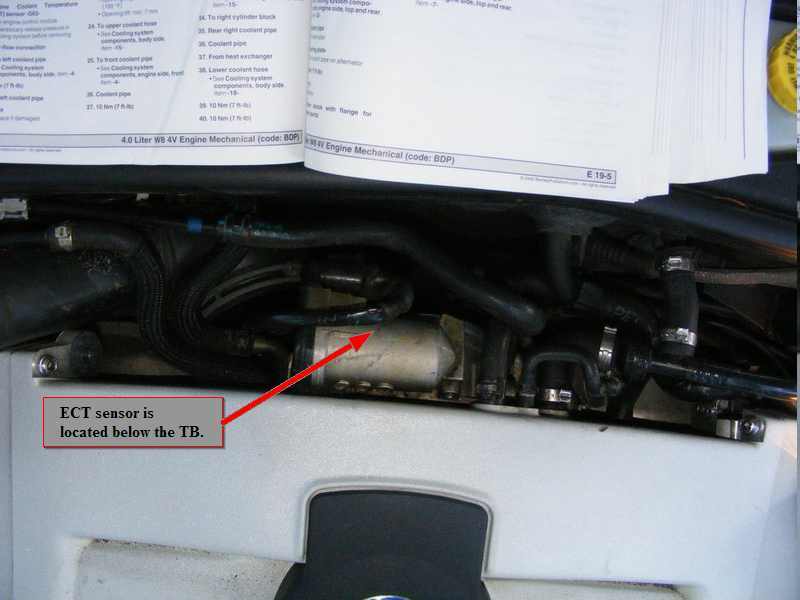 And I'm quite sure the W8 community will be happy to see more write-ups specific to our tight engine compartments! Flashlight or working light. A Mini-Mag is perfect. 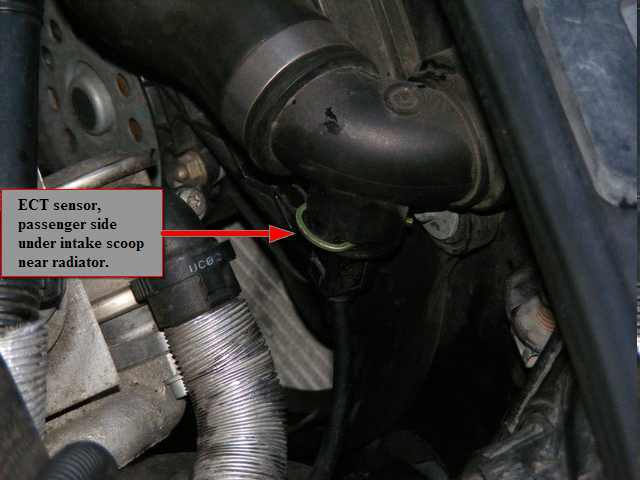 Start by removing the air intake tubing and the triangular mouth piece that attaches to the front wall above the radiator. Set aside. 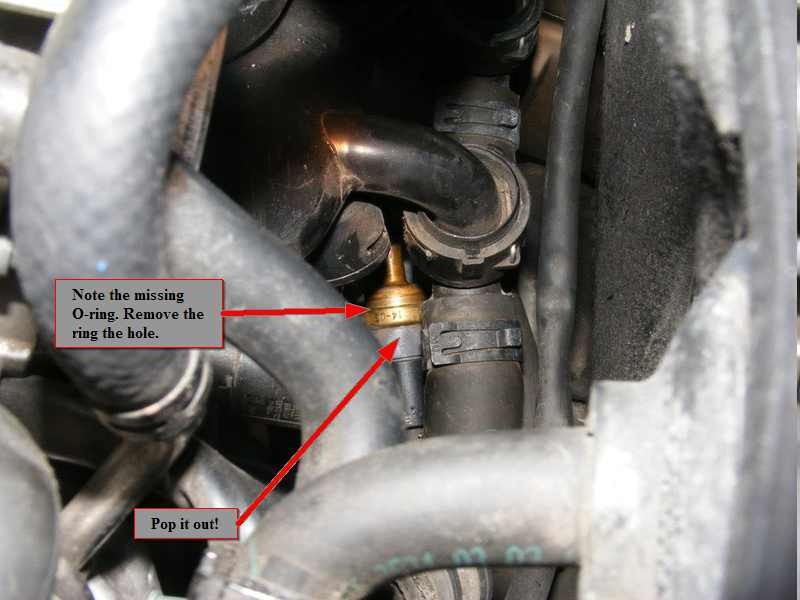 if the engine is warm, slowly unscrew the coolant reservoir to release pressure. 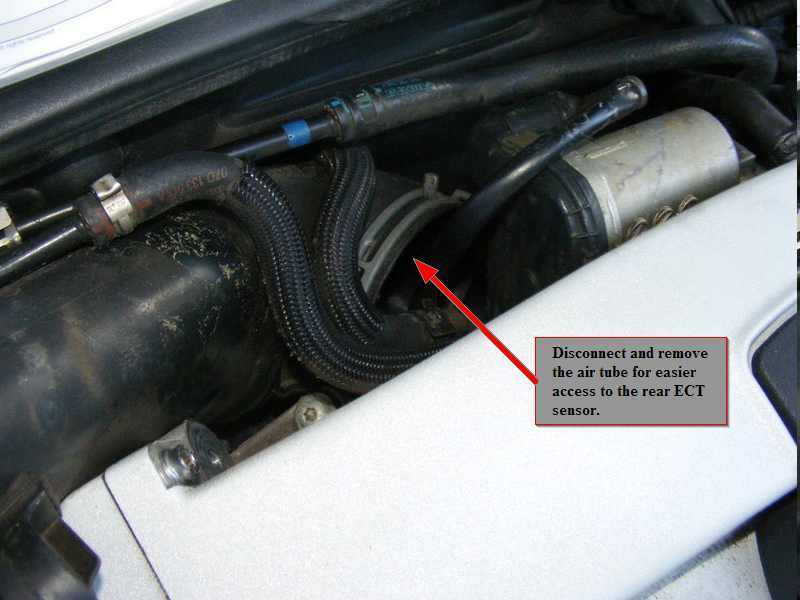 Once these are removed you will see the coolant return hose directly below. 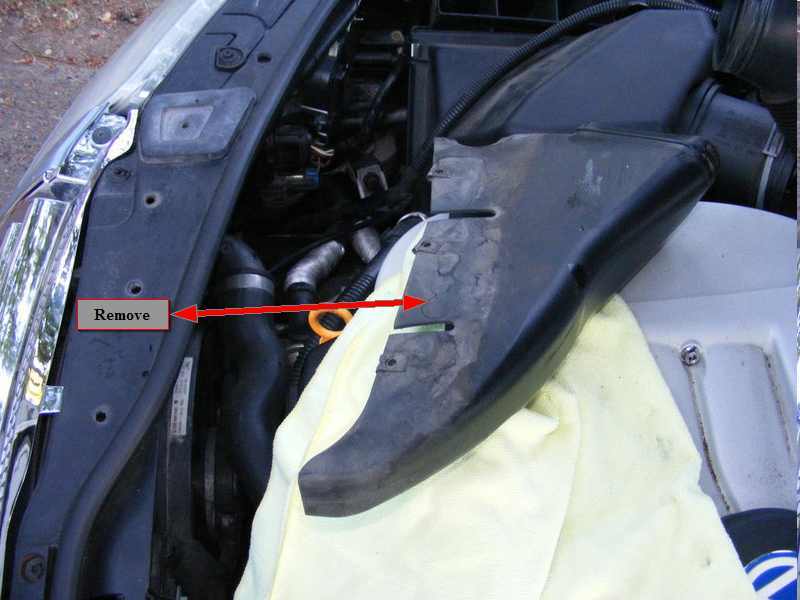 The sensor in question attaches at the underside of the elbow as seen below. BEFORE you remove the metal retaining clip from the housing, have a new sensor and seal ready to insert into the hole. 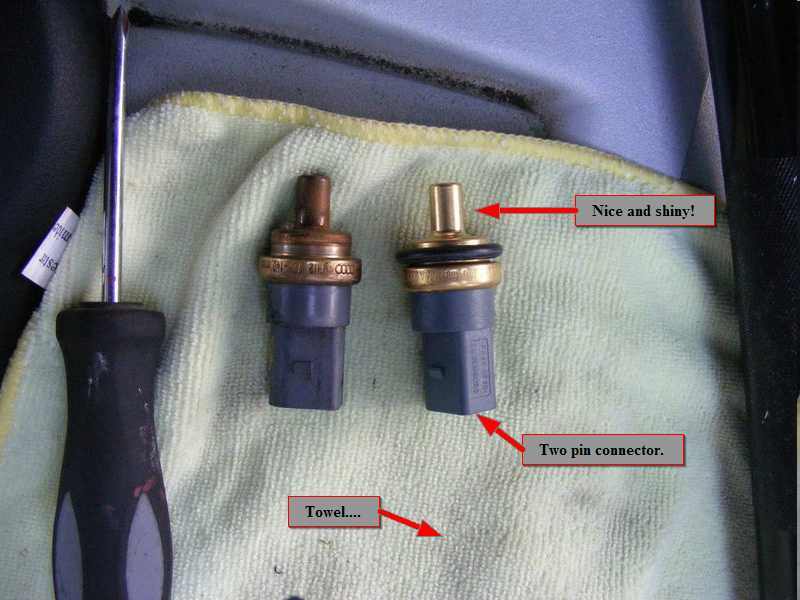 This will minimize the amount of coolant lost. I decided to first remove the electrical plug before pulling the sensor from the hole. This kept the plug dry. Pull the retaining clip out with your fingers. The plug is in the hole fairly snug, so a good tug will do the trick. At this point, * have the new sensor ready to fill the hole. 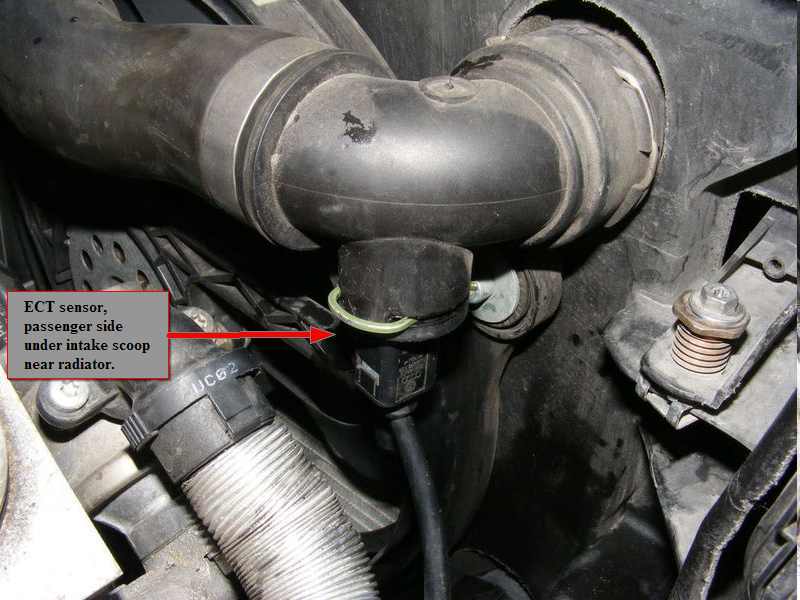 You may lose a few ounces of coolant with this maneuver, but don't sweat it. Replace what you lose. Reinsert the retaining clip as you apply firm upward pressure on the sensor. 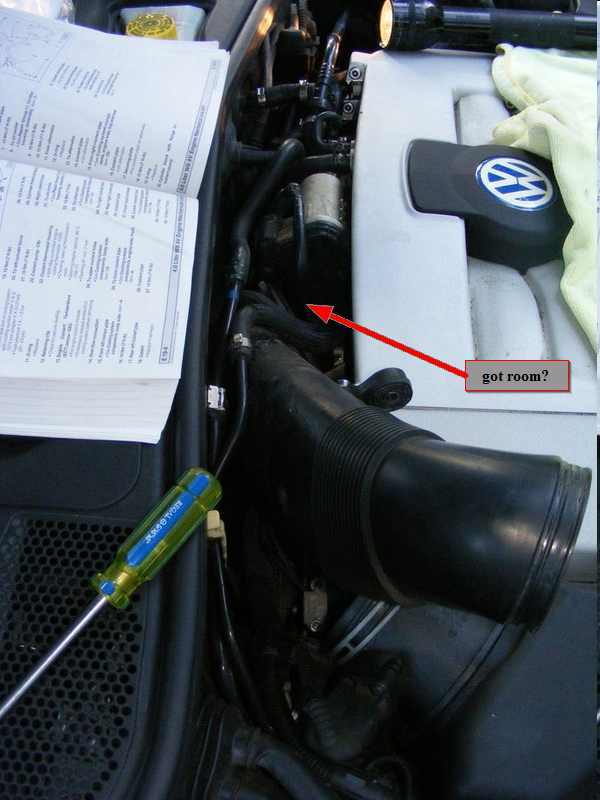 The sensor should sit securely in place with very little play. Next, reattach the plug. Not too difficult, right? Good. The next one is a pain…. 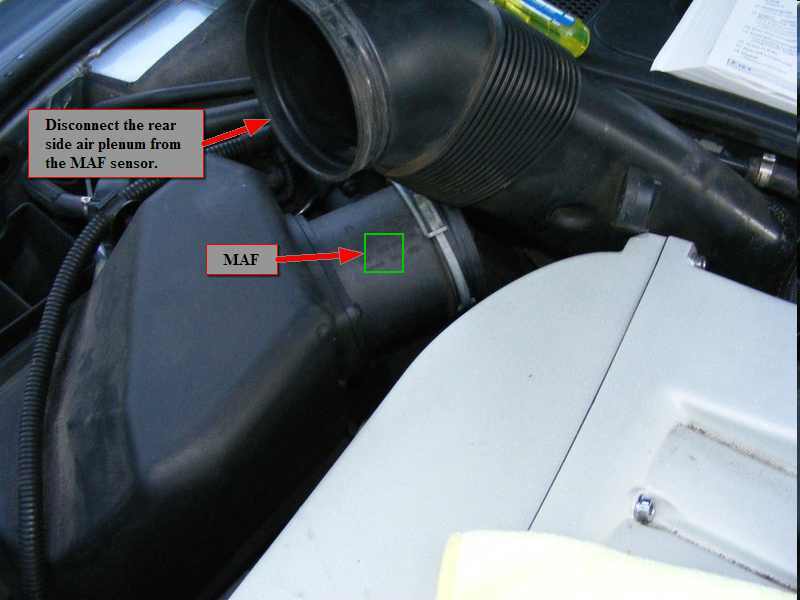 Now, onto the second sensor at the rear of the engine. First, you need to make some room. I found best to remove the tube completely from it's location. 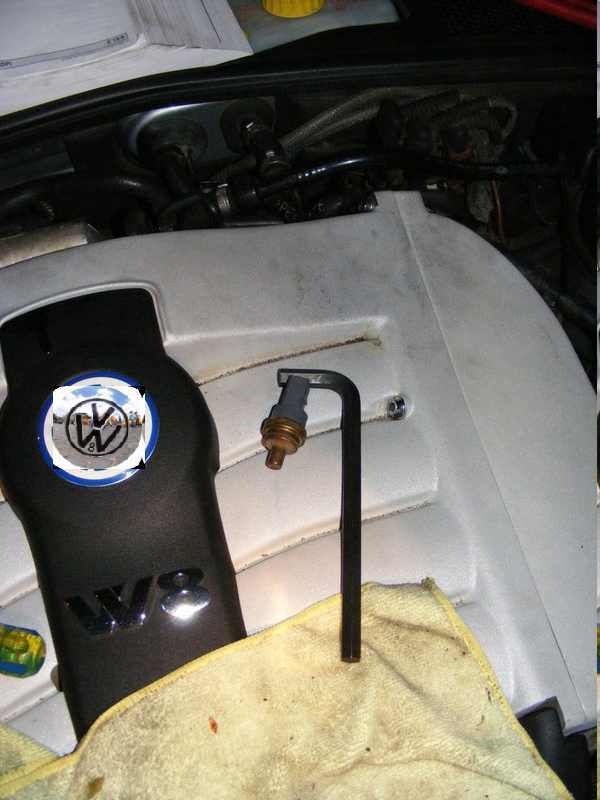 Use a 6mm ellen wrench to undue the attachment to the manifold. You will need every square inch/cm of space to squeeze in your grubby little hands. Now pull the plastic clip out of the housing. Pull the sensor out. 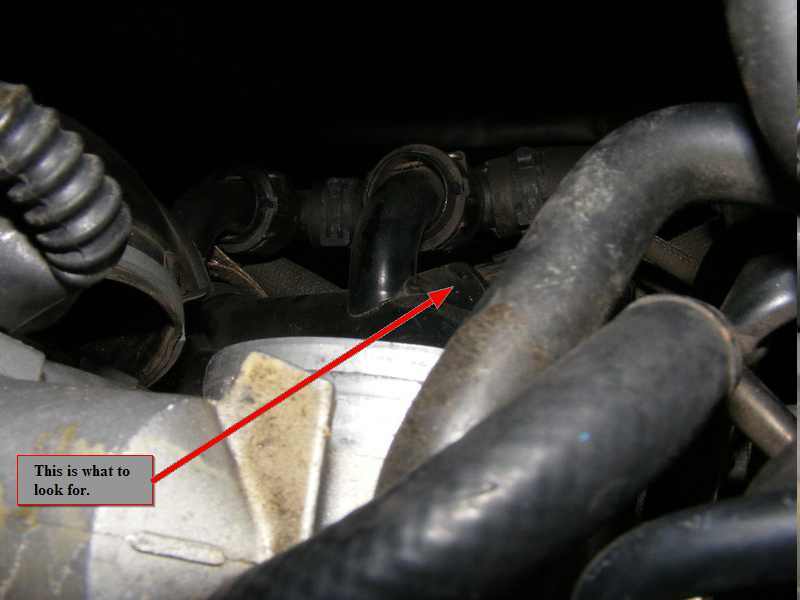 Some coolant might leak out but very little if any. Disconnect the plug and set aside. Now, I can't begin to tell you the Hell I went through trying to secure the sensor into place! Do not…I mean DO NOT plug in the new sensor before it is secure in the housing. The inside of the housing tapers in, so the closer the sensor will get to its final resting place the HARDER you will have to push it into the hole, and this area is SO tight it's difficult to get any leverage. With the plug on the sensor you risk damaging the low voltage wires. To get the sensor in the correct position I used an allen wrench in my left hand and applied firm pressure to the back end. Insert the retaining clip when the brass ring on the sensor is high enough above the clip grooves on the housing. You will know if it is in the correct position when the clip easily inserts. With the clip back on, grip the sensor and feel for proper seating. You will want to have very little play. Attach the plug. 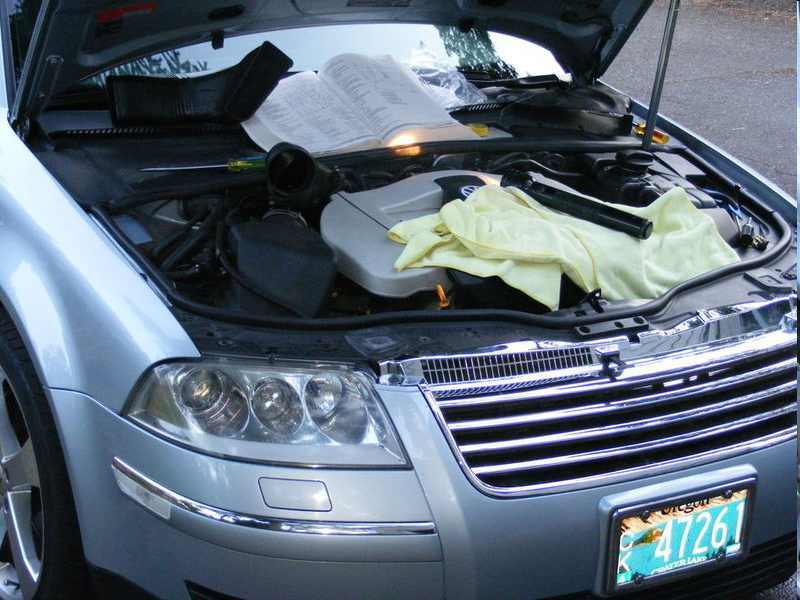 All that is left to do is to reattach the intake tubing and determine the amount of coolant you'll need to replace. Oh yeah….the upper intake manifold makes a GREAT work bench!